If you want to be a mischief maker, learn how to properly TP a house here, also on WikiHow. Source: WikiHow "How to Toilet Paper a House"
2.) Wealthy Romans used wool soaked in rose water and French royalty used lace. 3.) Other things that were used before toilet paper include: Hay, corncobs, sticks, stones, sand, moss, hemp, wool, husks, fruit peels, ferns, sponges, seashells, and broken pottery. Ouch! 4.) It wasn’t until 1935 that a manufacturer was able to promise “Splinter-Free Toilet Paper.” Ouch, again! 6.) In 1973 Johnny Carson caused a toilet paper shortage. He said as a joke that there was a shortage, which there wasn’t, until everyone believed him and ran out to buy up the supply. It took three weeks for some stores to get more stock. TP trivia taken from Buzzfeed's article, "36 Weird Things You Never Knew About Toilet Paper." There is one last thing I want to tell you about toilet paper: toilet paper clogs! To prevent toilet paper clogs, use only the necessary amount and remember that it is better to flush twice then to risk a toilet clog. Also, do not use those "flushable wipes," however enticing they are. 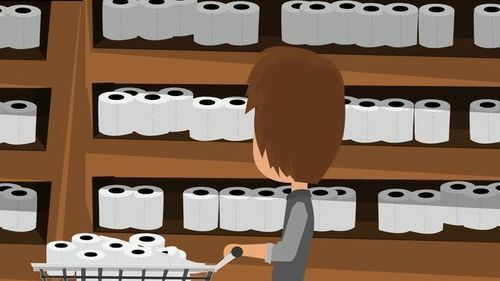 They're not as flushable as you may think.To find out more about how to avoid toilet paper clogs, check out these toilet paper reviews by Good Housekeeping, which uses clog-ability as a ranking category. If you have a clog, visit our drain and sewer repair page. If the clog is really serious, consider High Pressure Water Jetting. For all your plumbing problems, call the New Jersey Plumbing experts, at (732) 365-3199. For more information, visit our website and follow us on Facebook, Twitter, and Google+.